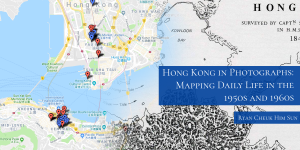 Hong Kong in Photographs: Mapping Daily Life in the 1950s and 1960s is a digital humanities project that plots a series of old photographs taken around Hong Kong onto a map of present-day Hong Kong. It visualizes the rapid industrialization and physical changes that made Hong Kong into a modern cosmopolitan city. From scenes of the iconic rickshaw pullers to the unchanging, ubiquitous street vendors, their actions, done in-the-moment, were recorded. Using photographs from the Hong Kong Heritage Project and the University of Wisconsin-Milwaukee Libraries, this project offers a glimpse of a slower-paced and oft-forgotten Hong Kong.